As the Meigs County libraries begin “Fall Storytime” this week with Miss Emily and Miss Anna, here is a look back to Storytime with Norma Hawthorne in the early 1990s. 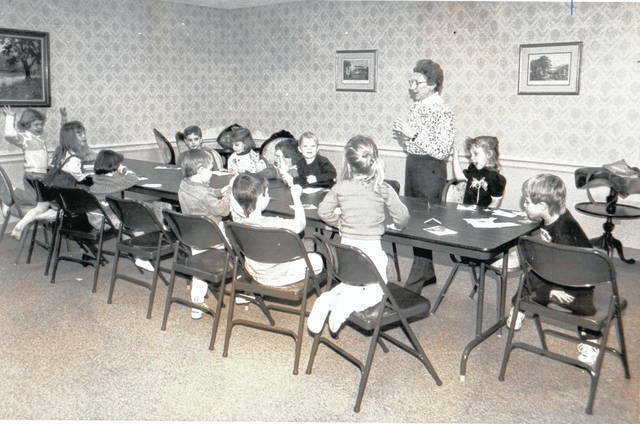 Hawthorne conducted weekly storytime and the Summer Reading Program for many years at the Meigs County libraries. Storytime included stories, crafts and other activities for children of all ages much as it does today at the local libraries in the county. This year’s Fall Storytime will be held Sept. 10 to Dec. 13. The Storytime schedule is as follows: Racine Library, Mondays at 1 p.m.; Eastern Library, Tuesdays at 1:30 p.m.; Pomeroy Library, Wednesdays at 1 p.m.; and Middleport Library, Thursdays at 1 p.m. Additionally, Wiggle Giggle Read will be each Thursday morning at 10:30 a.m. at the Pomeroy Library. https://www.mydailysentinel.com/wp-content/uploads/sites/14/2018/09/web1_9.13-TBT-Library_ne201891214293576.jpgAs the Meigs County libraries begin “Fall Storytime” this week with Miss Emily and Miss Anna, here is a look back to Storytime with Norma Hawthorne in the early 1990s. Hawthorne conducted weekly storytime and the Summer Reading Program for many years at the Meigs County libraries. Storytime included stories, crafts and other activities for children of all ages much as it does today at the local libraries in the county. This year’s Fall Storytime will be held Sept. 10 to Dec. 13. The Storytime schedule is as follows: Racine Library, Mondays at 1 p.m.; Eastern Library, Tuesdays at 1:30 p.m.; Pomeroy Library, Wednesdays at 1 p.m.; and Middleport Library, Thursdays at 1 p.m. Additionally, Wiggle Giggle Read will be each Thursday morning at 10:30 a.m. at the Pomeroy Library.